First Earl Baldwin of Bewdley K.G." Astley Town is a hamlet to the north, Seed Green is 2 miles N.E. The Burff is a hamlet 1½ miles east. ASTLEY : Marriages(I) 1539-1630: Boyd's marriage index [Typescript.] IN: Boyd's marriage index Published , 1925-55 Author Boyd, Percival ed. Source D: P Boyd. ASTLEY : Marriages(I) 1726-1812: Boyd's marriage index [Typescript.] IN: Boyd's marriage index Published , 1925-55 Author Boyd, Percival ed. Source D: P Boyd. Removal orders- examination of the poor & their legal place of settlement 18th & 19th cent. 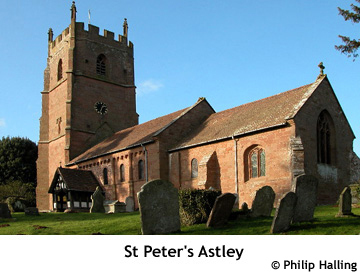 ASTLEY, a parish in the lower division of the hundred of DODDINGTREE, county of WORCESTER, 3 miles (S. W. by S.) from Stourport, containing 784 inhabitants. The living is a rectory, in the archdeaconry and diocese of Worcester, rated in the king's books at £15. 13. 4, and in the patronage of the Rev. D. J.J. Cooks. The church, dedicated to St. Peter, is of Norman architecture. An Alien priory of Benedictine monks, founded here by Ralph de Todeni, in the reign of William I, was annexed to the college of Westbury in that of Edward IV. Here is a school, endowed with about £20 per annum. At Redstone ferry, in the vicinity, is an ancient hermitage, excavated in a lofty cliff by the side of the river.